On a cost per wear basis this army style jacket has paid for itself many times over. I definitely consider this colour of green to be a great alternative neutral colour to work with. In fact the whole outfit is based on neutrals which is odd for me since I'm usually wearing some bright colour. This gives me an idea for my outfit today! 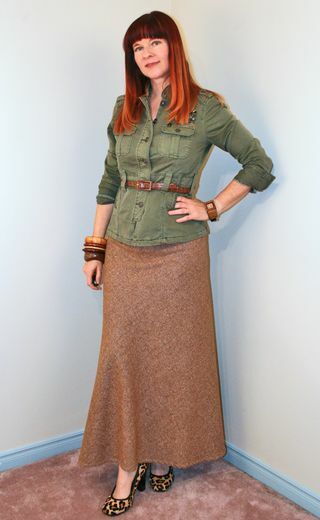 I was having trouble figuring out how to incorporate my maxi dresses into this Dressember challenge. Love it! 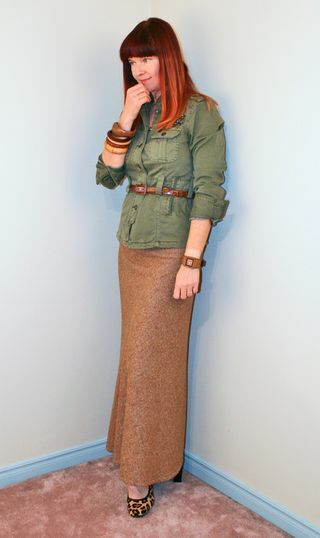 Love this outfit, military with long skirt – it adds feminine touch to the whole look. You hair color looks fabulous with this green jacket! I’ve seen so many style bloggers doing great things with olive army jackets. Thrifting one is now high on my list 🙂 You look really beautiful, long and lean. And I don’t see no turkey neck, lovely lady! Happy to inspire someone : ) Thanks for popping by Silver. Thanks Olga. I find this colour works well on almost everyone. I think this style of jacket would look great on you. You always seem to find the best stuff when thrifting so I’m sure you’ll find what you’re looking for. I think my favorite part of this outfit is definitely your shoes. I love the hint of leopard! Such a cute look! 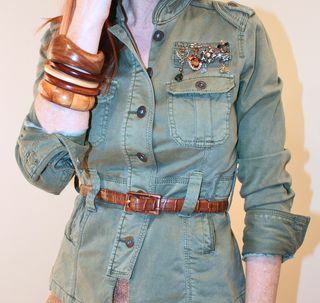 Loving how you added the brooches to the military top! 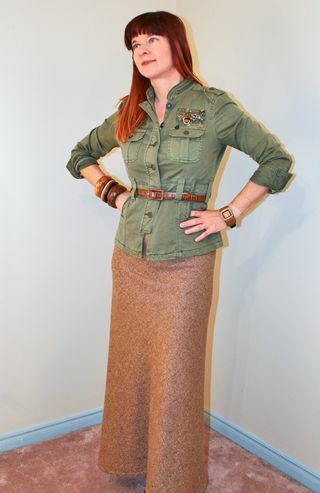 I love that jacket…the rhinestonesd are awesome and it looks great with a maxi skirt. I want that jacket! I love it. This is a genius combo – you look fab! Thanks Lindsey : ) I sent the address via email yesterday.